Who says you can’t have it all? 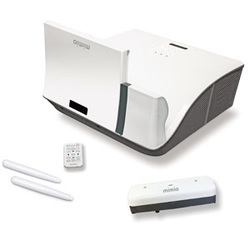 If you’re interested in an easy and affordable way to bring touch-enabled collaborative learning into the classroom, get the MimioProjector™ touch projector. Now you can turn your conventional dry erase boards into touch boards! Touch-enabled collaboration with the computers and whiteboards you already own. • An affordable way to bring multi touch, interactive collaborative learning into classrooms that don’t have projectors. • Creates an interactive touch area as large as 100 in. diagonal. Allows up to 10 single-point touches or 5 dual-point touches with gestures. • A full-featured solution that includes MimioStudio™ classroom software. • A true HDMI experience, with stunning images and audio – no need for separate speakers. • Using styli or finger touch, multiple students can simultaneously interact with the same projected image, enhancing collaborative learning. • Laser Curtain Module is powered directly from the projector – no extra wires or complicated installation. • Easy alignment – takes less than a minute with the Visible Light Alignment feature. • Bulb can be replaced without dismounting the MimioProjector device. Up to 5000 hours between bulb replacements.